We just introduced them to you last Thursday, the new OMEGA Speedmaster caliber 9300 collection. The buzz of the Baselworld is definitely the black “Dark Side of the Moon” Speedmaster Co-Axial caliber 9300 model, but this week we focus on that other novelty. The Speedmaster ’57 Co-Axial or, as it is officially being called, the Speedmaster ’57 OMEGA Co-Axial Chronograph. We’d like to keep it simple, it is the Speedmaster ’57 Co-Axial or Speedmaster ’57 caliber 9300. As you know, the Speedmaster has its roots in 1957. We did cover it many many times, but if you want to read about these very first 1957 Speedmaster models, click here. 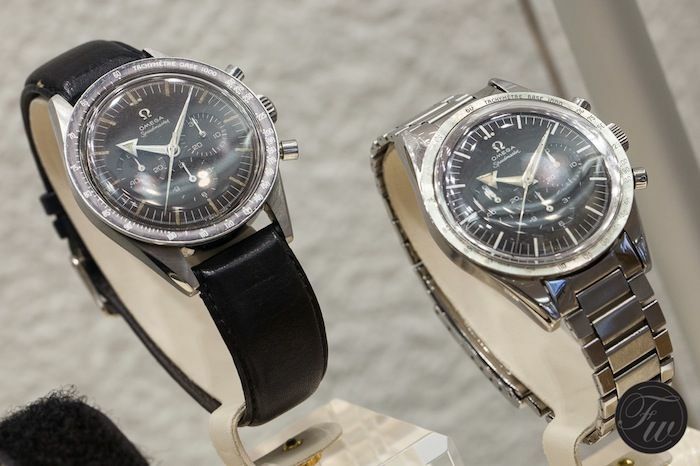 In the picture above, you can see the Speedmaster CK2915 (1957) on the right. Broad Arrow hands, straight lugs, a stainless steel bezel (no black aluminium inlay) and a flat link bracelet. These ingredients of the original CK2915 Speedmaster from 1957, have clearly been the starting point to (re)design the caliber 9300 Speedmaster co-axial that OMEGA introduced in 2011 (we reviewed it here and here). As you can see, the Speedmaster ’57 Co-Axial Chronograph doesn’t have the Broad Arrow hands like the original model, with the large arrow on the hour hand, but you will find it on the small hour recorder at 3 o’clock. 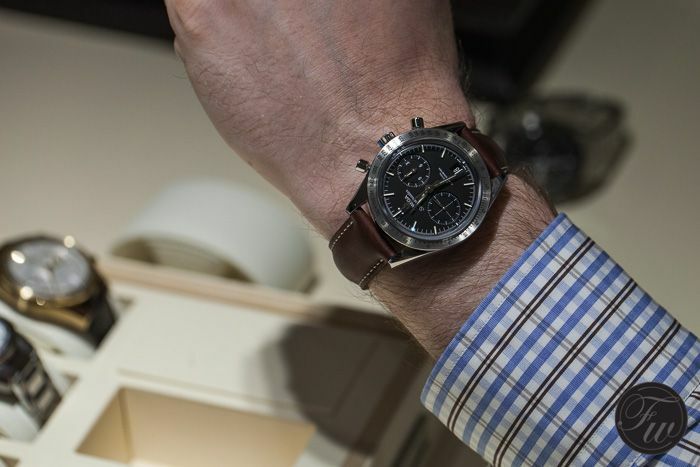 Also, perhaps what I like best, is the fact that the case is a tad bit smaller (41.5mm) than the regular OMEGA Speedmaster Caliber 9300 model (44.25mm). 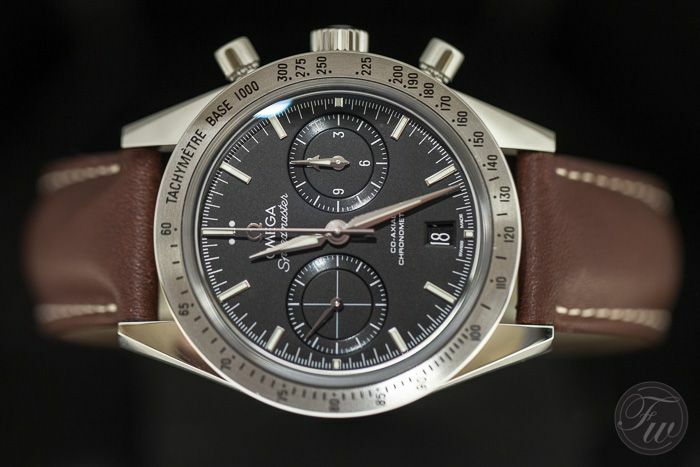 Note that the standard Speedmaster Professional 3570.50 is 42mm (and the original Speedmaster CK2915 was 39mm). The straight lugs and lack of crown guards are a friendly nod to the original. The Speedy ’57 Caliber 9300 is very comfortable to wear. I love this watch. The sub counters seem to be a big larger than the normal 9300 model. I am not sure about this, but at least it appears as there is a bit more symmetry on the dial. The movement is, of course, the in-house designed and developed OMEGA caliber 9300. The gold models have the caliber 9301 movement, which has a different optical finish. More about the Co-Axial movement caliber 9300 can be found here. 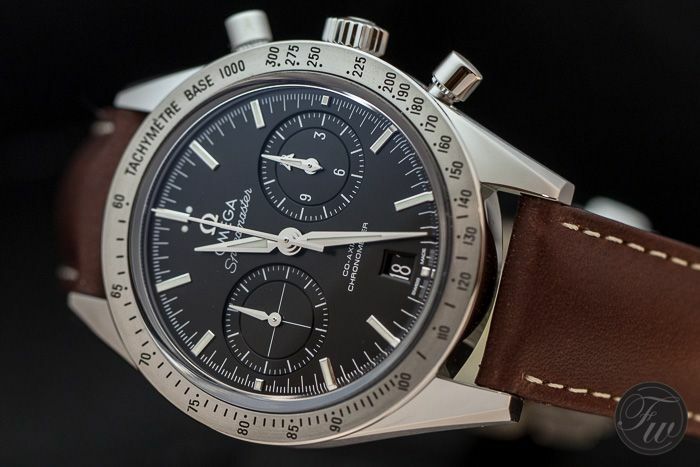 Let us know if you have a Speedmaster that you want to see featured on Speedy Tuesday! Drop us a line.